Paxton 1964-1968 Carb Mustang (Driver Side) N1200 Polished [1001840-P] : Supercharger Superstore, Your Online Source for Vortech Superchargers, Paxton Superchargers, Procharger Superchargers, Magnacharger Superchargers and Techco Superchargers! As a tribute to the Paxton supercharged Shelby GT-350s of the ‘60s, we offer current systems for V8 powered carbureted Ford Mustangs designed to fit under the stock hood. With a horsepower increase ranging from 30% to more than 75% (depending on engine build), the new gear-driven, nearly silent NOVI-1200 or NOVI-1500 supercharger will provide street superiority. 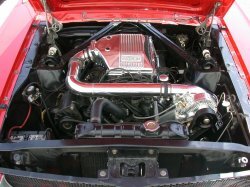 The NOVI supercharger uses a 3.7” 8-rib supercharger pulley, which produces approximately 7-1/2 PSI @ 5500 rpm on a stock V8 engine.